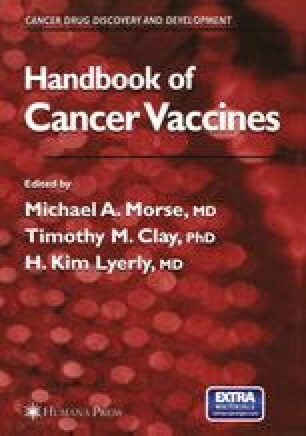 It is widely accepted that tumors may evade the immune response by a number of different mechanisms described in Chapter 6 including: antigenic variation, downregulation of tumor-specific antigens, downregulation of major histocompatibility complex (MHC) molecules, and lack of sufficient costimulation to T cells by tumors that are considered as “self.” Mechanisms by which tumors may suppress the immune system include: interference with antigen processing and/or presentation, induction of apoptosis in lymphocytes by Fas ligand (FasL) or other “death” receptors, interference with the ability of leukocytes to migrate into the tumor, and active tumor-mediated immunosuppression. Although support for all of these mechanisms exists in experimental models and/or specific tumor types, there is mounting evidence that active tumor-mediated immunosuppression may be the most general and potent way for human tumors to escape the immune system. In addition, current evidence supports a model by which this active tumor-mediated immunosuppression is largely the result of secretion of the potent immunosuppressive cytokine, transforming growth factor-ß (TGF-ß). In this review, the evidence supporting such a role for TGF-ß and the mechanisms by which TGF-ß may be acting to suppress the immune system are discussed. Finally, strategies to target the TGFß-signaling pathway to ultimately improve the success of immunotherapy for human cancers are explored.